Although drones are settling down comfortably into the photography, delivery, and racing categories of gadgets, it seems there is still so much more that they can do. Drone maker Freefly aptly demonstrated that recently, after hooking up a towrope to one of their huge ALTA 8 multi-rotors and taking a surfer for a ride. 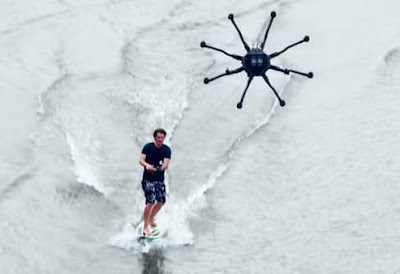 Yep, Drone Surfing is here, baby! No matter how much fun it looks, it seems that pulling a human along the water takes a massive toll on the drone. Freefly say that currently the ALTA 8 can only manage three 30 second passes while towing the surfer before it requires a battery change. Still, as with most technology, if the batteries were to improve this could open up the door to a new and exciting sport.